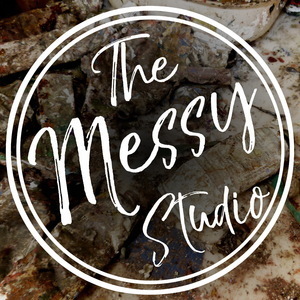 We found 10 episodes of The Messy Studio with Rebecca Crowell with the tag “art”. Rebecca discusses the role of intuition in abstract work with Nuala Clarke and Joanna Kidney at Ballinglen Arts Foundation in Ireland. Ireland, a place she returns to every year for teaching for her own time to paint. She shares some of the ideas that were the focus of her advanced cold wax workshop there, and we discuss how they relate to personal voice in your own work. of galleries and collectors can be a big reason we avoid change or worry about it. experiences of one Chicago painter who has shared her struggle with Rebecca. talked about last week) but blocks and down times can happen any time of year. Rebecca and Ross discuss the difficulties of dealing with the extreme winter that many artists are experiencing. This week Rebecca talks with Stephanie Dalton, an Atlanta, Georgia artist who shares her experiences of grief and loss following the death of her husband Robert Cowan last May--including how this has affected her creative process. We really appreciate Stephanie's openness in discussing this difficult topic, which she offered to do in the hopes that it will help others who have suffered a similar loss. March 3 marks Rob's 53rd birthday and their 26th wedding anniversary. Stephanie asked that we broadcast her interview on this day as a way to honor her late husband. A lot of us are inclined to say yes to any art opportunity—always looking to advance our art careers and open up new pathways. But how can you keep your calendar clear enough to stay focused and do your best work? What activities, passions, or interests do you pursue outside your studio (art related or otherwise)? Do you think they feed your main work or focus? Rebecca and Ross discuss listener answers submitted on Facebook, as well as their own thoughts on the subject. Rebecca and Ross talk about how to pace yourself to be efficient and avoid burnout... skills that they haven't actually mastered themselves.